Do you need to convert EDB to PST format immediately? Are you looking for an effortless way to do so? Haven’t you found the right solution yet? Don’t worry, let me help you here. Remember, EDB and PST files are different from each other. You can open these files in their respective applications only. In this very article, we’ll understand the basic difference between these two files. Also, we’ll learn how to convert EDB to PST file format in two different ways. Some novice individuals may find the relation between Microsoft Outlook and Exchange Server a little confusing. Generally, both these programs work together, i.e. Microsoft Exchange operates on the server and Microsoft Outlook works as a desktop email client. We’ve already discussed a lot about the Outlook client in the previous posts. This time let’s find out what exactly Microsoft Exchange Server is. Microsoft Exchange Server is far more than a simple email server. Microsoft Exchange Server is a set of applications for digital messaging and collaboration widely used in large corporations. It enables multiple users of an organization to communicate securely through email messages, voice mail, instant messaging, and text messages from their desktops, mobile devices, and web browsers. An EDB file stores the mailbox data which include email messages, attachments, calendars, tasks, notes, folders, etc. It’s basically designed on a single client-server architecture. Microsoft Exchange Server creates two main EDB files to store the exchange information: Priv1.edb and Pub1.edb. Both these EDB files have a corresponding STM file containing SMTP messages. PST is an Outlook data file that stores almost everything, such as email messages, contacts, calendars, notes, tasks, attachments, etc. There are two types of PST file: ANSI and Unicode. EDB files are a bit tricky to work with. On the other hand, Outlook data file is far more flexible. Unlike EDB files, PST files can easily be backed up, moved from one system to another, and opened by using the different versions of Microsoft Outlook. Sometimes it may happen that you need to convert EDB to PST file format. EDB and PST are two different files which can only be opened in their respective email clients. Scenario #1: Let’s suppose the Exchange Server crashes down and goes for maintenance. It may take a long time to be repaired. In the meanwhile, you urgently need to access some data. But you can’t do that due to Exchange Server crash. In such a situation, you can convert EDB to PST format so that you can access the data without waiting for Exchange Server to be repaired. Scenario #2: Sometimes due to data portability needs, you may need to convert EDB to PST format. Whenever it’s required to share the data present in the Exchange mailbox to other email clients, EDB conversion becomes a necessary task. Scenario #3: Whenever a user of Exchange Server leaves the organization, the data should be moved to a secure location so it can be further used or analyzed. In order to keep the record of any previous user, EDB to PST conversion might be required here. Now the question is, “how to convert EDB to PST format”. 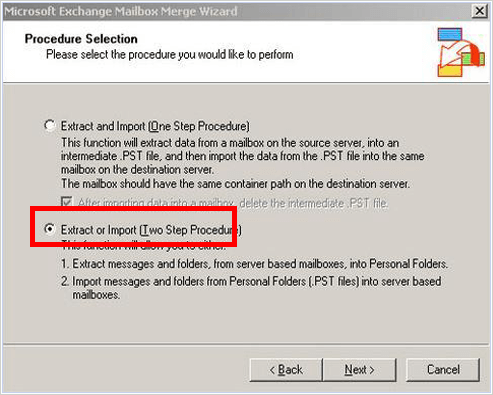 The ExMerge utility provides a great way to export a mailbox to an Exchange PST file. Microsoft provides the Mailbox Merge tool, commonly known as the ExMerge utility. It’s a freeware program that can help you extract data from the mailboxes of an Exchange Server and then merge the same data into the mailboxes of another Exchange Server. Additionally, the ExMerge utility can copy the data from the source server into a PST file. Most of the Exchange administrators must be familiar with the Mailbox Merge tool, ExMerge utility. Whenever you need to export the mailbox into a PST file, you can simply use this tool. For example, a user leaves the organization and wants to take a copy of the mailbox data. 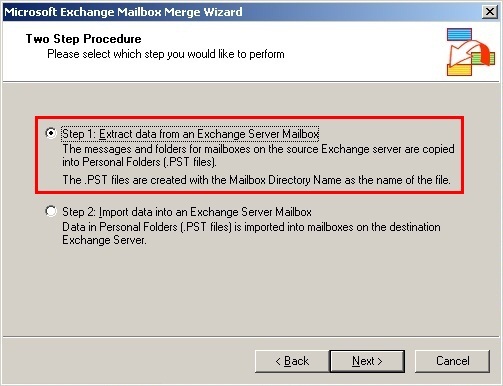 The Exchange administrator can use the ExMerge utility to export the user mailbox into a PST file. Important note: Since the ExMerge utility ain’t available for Microsoft Exchange Server 2007 and later versions, you have to download it from the Internet. How to use the ExMerge Utility? You need to select “Extract or Import” (Two Step Procedure). Then click Next to continue the process. You need to select “Extract data from an Exchange Server Mailbox”. Then again click Next to continue the process. Step 3: A new window Data Selection Criteria will appear. You’ll see a number of tabs here. First, click the Import Procedure tab. Select Archive data to target store, and then click OK.
Now click the Message Details tab. You need to fill in the required details, and then click OK.
And then click Apply to save the changes. Step 4: Now you can see a list of the mailboxes available on the Exchange Server. Select the desired mailbox in the list, and click Next to continue the process. Step 5: You need to specify the target directory. Click Browse and define a location where you want to save the new PST file, and then click Next to continue the process. Step 6: The migration process will be started. Within a couple of minutes, the process will be successfully completed. Finally, click Finish to close the Mailbox Merge (ExMerge) program. And most importantly, running the ExMerge utility is a lengthy and time-consuming process. If the ExMerge utility doesn’t work for you, it’s better to look for a professional solution. Although there are plenty of options out there to help you convert EDB to PST file format, none is better than Shoviv EDB to PST Converter. It’s one most trustworthy and result-driven solutions for Exchange administrators. The EDB to PST converter from Shoviv Software is an outstanding solution for Exchange administrators. It scans the EDB file objects and enables you to verify its content in the preview session. And ultimately, you can save the mailbox data into PST and other file formats. Don’t worry if you’re novice computer user. The complete process is hassle-free, i.e. no prior technical expertise is required. 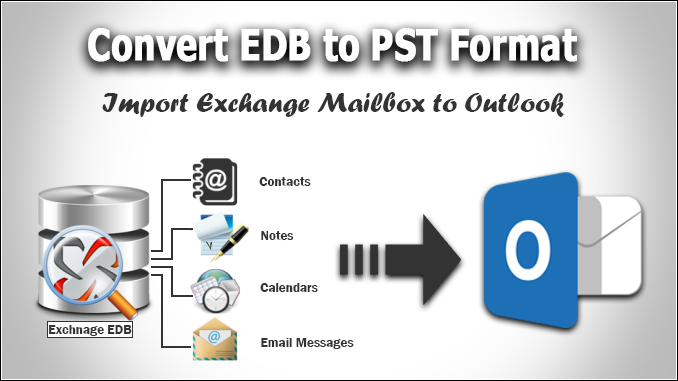 Via this software, you can successfully export the mailbox from Exchange to Outlook by converting EDB to PST file format. Also, you can export the mailbox data to Live Exchange and Office 365. This smart converter tool can be used even if the EDB files ain’t accessible, i.e. corrupted. During EDB to PST conversion, it maintains the data integrity without any alternation. Additionally, it can save the EDB files’ data into multiple other file formats which include EML, HTML, MSG, etc. The EDB to PST Converter tool is available for free evaluation. Before purchasing the software, users are strongly recommended to download its free demo version. By using the demo version, you can save first 25 email items from each mailbox folder of the selected EDB file. And if you’re satisfied with the results, then you can purchase the software. The article explained the most common reasons for EDB to PST conversion. Also, we’ve learned how to export mailbox data from Exchange to Outlook by using the ExMerge utility. However, in the end, a smart professional EDB to PST Converter is mentioned to give users a choice.